At the Rice Law Firm, client satisfaction is our first priority. We understand that clients want prompt, courteous and fairly priced service, and not at the expense of quality. Through technology, skill and effort, the Rice Law Firm has established a reputation for delivering this type of service. 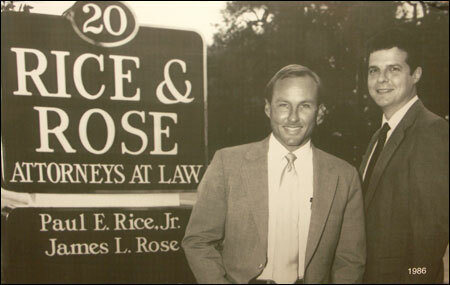 In 1986, after a tenure together in another local firm, Paul E. Rice, Jr. and James L. Rose, 1983 and 1982 graduates of the University of Florida College of Law, respectively, formed the law firm of Rice. Philip J. Bonamo earned partnership on January 1, 2009, after four solid years as an associate with the firm. In 2016, James Rose retired after a 30 year successful partnership with Paul Rice. Raymond L. Schumann became a partner in February 2017. A new era in the firm history occurred in 2001 when the Rice Law Firm took occupancy of its 10,500 square foot office building. The firm purchased an older builder on the beachside in Daytona Beach, razed it and constructed a purpose-built state of the art law office. The building has attractive space for up to ten attorneys and provides the platform and resources required to deliver high quality legal services. In addition to three partners, the firm has three associate attorneys, an attorney of counsel, six legal assistants/paralegals and four administrative staff, all likewise dedicated to providing superior service. The Rice Law Firm has been representing individuals and businesses in east central Florida since 1983. All three of the Firm’s partners are board certified by the Florida Bar. Only six percent of all attorneys in Florida are board certified. The Rice Law Firm is rated AV Preeminent by Martindale Hubbell, the leading national law firm directory. For additional information regarding the credentials of the attorneys please refer to their respective profiles on our website. The Daytona Beach attorneys at RICE Law Firm represent clients throughout the state of Florida. The practice areas of our lawyers include business and corporate law, divorce and family law, real estate law, personal injury and wrongful death, wills, trusts and probate, and criminal defense.